BILLINGS, Mont. (AP) — Republican Senate candidate Matt Rosendale accuses his Democratic opponent, Sen. Jon Tester, of obstructing the confirmation process of Supreme Court nominee Brett Kavanaugh by refusing to meet with him before deciding to vote against his nomination. The claim against the two-term incumbent feeds into State Auditor Rosendale’s narrative of Tester as hostile to the agenda of President Donald Trump, who won Montana by 20 percentage points in 2016. Rosendale began attacking Tester for his votes on Supreme Court picks months before Kavanaugh was nominated and became embroiled in sexual misconduct allegations. 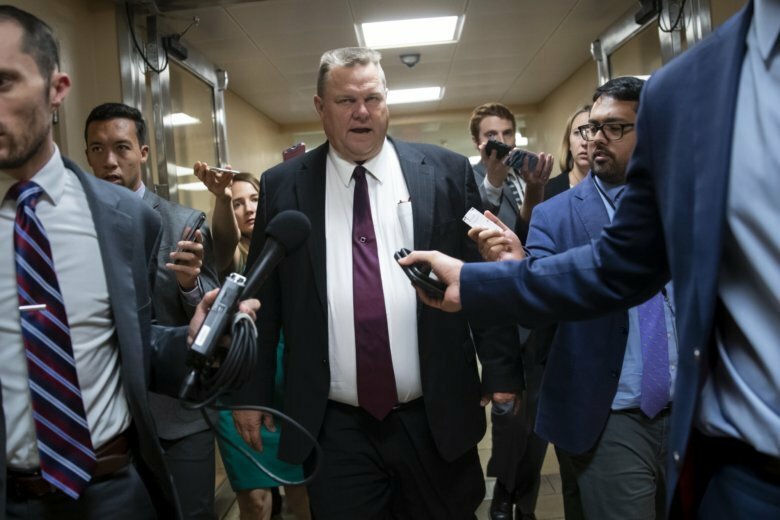 Rosendale said Tester put gun rights at risk with votes against Trump’s previous nominee, Neil Gorsuch, and in favor of Barack Obama’s nominees, Elena Kagan and Sonia Sotomayor. With Kavanaugh, Rosendale again is trying to link Tester’s decision to the Second Amendment and portray him as not to be trusted on guns. Tester, a gun rights supporter, dismisses the claims. He announced his opposition to Kavanaugh, citing sexual assault allegations by Christine Blasey Ford, concerns over Kavanaugh’s defense of government surveillance programs and his support for corporate money in politics. ROSENDALE: “Jon gave his word nearly three months ago that he was going to at least take the time to meet with Judge Kavanaugh and he didn’t. He put off the meetings, he put off the meetings. At one point Jon came out and said the White House canceled the meeting then had to retract that statement,” — debate on Sept. 29. THE FACTS: Rosendale got it mostly wrong. Tester’s staff attempted multiple times to set up a meeting but could not agree with the White House on a date, according to emails released by Tester’s office. But Rosendale was right that Tester falsely claimed the White House canceled a meeting. The emails show White House staff reached out on July 24 to see if Tester was available to meet with Kavanaugh the following week. Tester’s scheduler instead suggested a meeting in late August and offered three possible dates. When White House staff didn’t take up the offer, representatives of Tester followed up at least eight times through mid-September seeking a meeting, the emails show. An administration official said there were attempts to accommodate senators who were possible swing votes early in the process, but as Kavanaugh’s early September Judiciary Committee hearings approached the schedule got clogged. “There was certainly on the White House’s part a good-faith effort to meet with any persuadable Senator,” White House spokesman Raj Shah told The Associated Press. On August 31, Tester said that a meeting with Kavanaugh had been scheduled but was canceled by the White House. By the next day Tester’s spokeswoman, Marnee Banks, had told reporters the Democrat misspoke. Banks said it was “an honest mistake” based on a misunderstanding between the senator and his staff. Without a face-to-face meeting, Tester said he made his decision on Kavanaugh based on an examination of the nominee’s record. “I had to go off the information I investigated and determined he was not a good candidate,” Tester said during Saturday’s debate. This story has been updated to correct that Tester is a senator, not a representative.